Make your party shine like a diamond! Our Sempertex Metallic Balloons are the perfect finishing touch to your party decor, no matter the celebration and event. 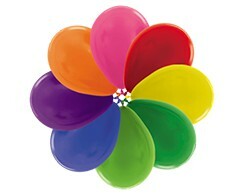 With these Sempertex Metallic Balloons, your party is guaranteed to be full of glitz and glamour. Check out the decorator quality colour range, so many gorgeous colours to choose from. Just a quick note to thank you and your staff for your wonderful service in fulfilling our order and delivering to the RACV Royal Pines last Saturday. They balloon bouquets looked great. Absolutely amazing! I had a gender reveal balloon made up for the baby I’m having and it was so beautifully made. Would highly recommend! Definitely a returning customer. Thank you for the amazing service!